Sushi Saito in Tokyo has long been regarded as one of the best sushi restaurant in the world. 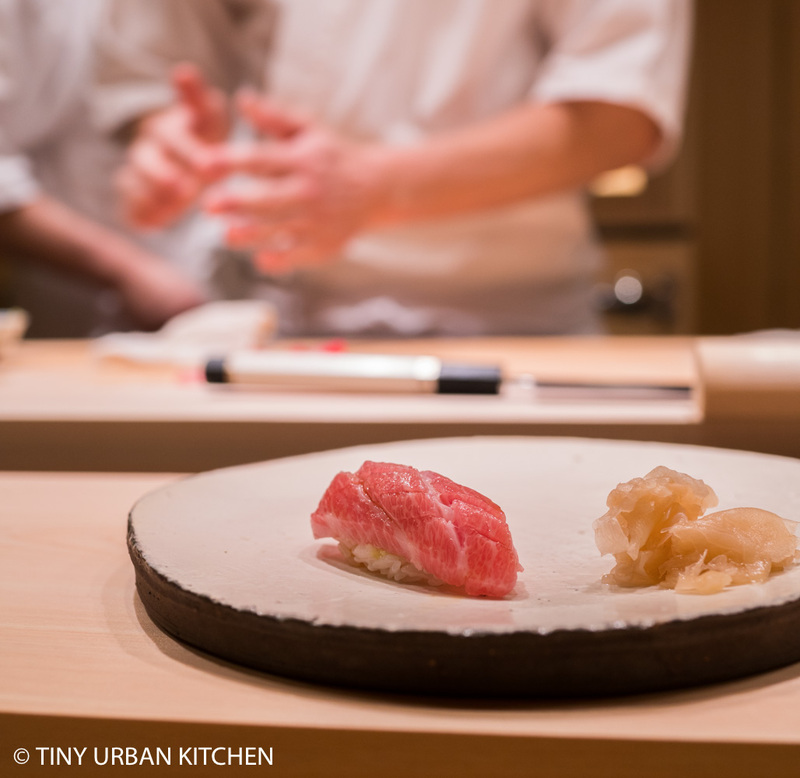 It ranks number one on Japan’s popular Tabelog (user-rated) website, and it has its fair share of accolades (Three Michelin stars, 26th on World’s 50 Best, etc.). Sushi Saito is also one of the most exclusive restaurants. It is virtually impossible to get a reservation at the restaurant unless if you are an existing customer, or you are introduced by an existing customer. You can’t just ask your hotel concierge in Japan to request a reservation on your behalf. Sushi Saito requires a personal referral from a prior customer, preferably a regular. For this reason, Sushi Saito has been elevated to a cult-like, unattainable status, a bucket-list item that many sushi lovers obsess over and dream about endlessly. 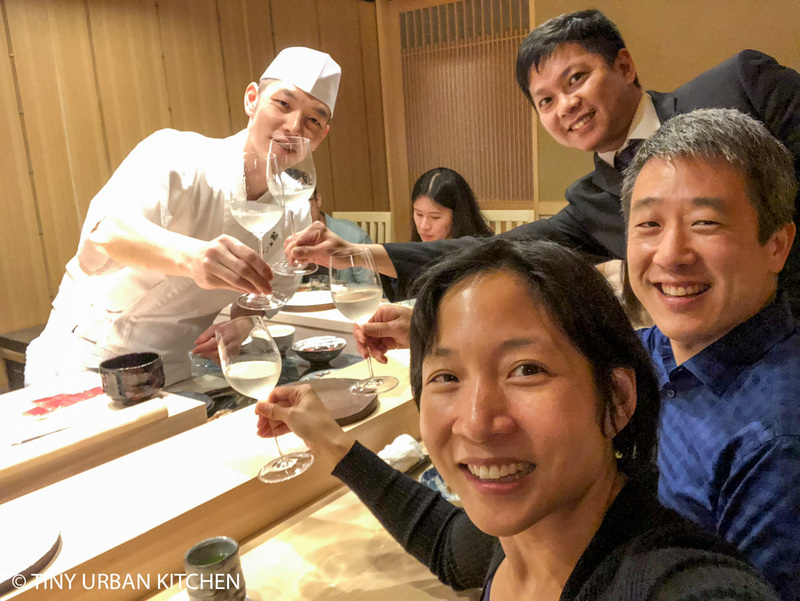 Imagine the uproar and fervor that arose when news came out in late 2017 that Sushi Saito was planning to open up a second location in Hong Kong, in partnership with the Global Link Restaurant Group. Immediately, questions began flying around. How do you get a reservation? Do you need to also have a friend refer you? Reservations seemed virtually impossible to obtain. Phone calls to the Four Seasons only led to referrals to an email address, which courteously responded by simply stating “Sushi Saito is not taking any new reservations for the time being.” It seemed to be true that you needed a connection with someone who had gone to Sushi Saito Tokyo before, or at least had dined at one of Global Link’s other restaurants, Ta Vie or Tenku Ryugin. Indeed, we eventually got our reservation several months later through a friend who worked at Sushi Saito. Unlike Sushi Saito’s more understated office building location in Tokyo, Sushi Saito in Hong Kong is located on the 45th floor of the Four Seasons, one of the most prestigious addresses in all of Hong Kong. It rubs shoulders with the likes of Lung King Heen (3 Michelin starred Cantonese) and Caprice (2 Michelin starred French). The restaurant has two separate sushi bars, each with eight seats. Chef Kobayashi and Chef Fujimoto (pictured above) run the two sushi bars. Both worked at Sushi Saito in Tokyo before moving to Hong Kong to open this new location. Chef Kobayashi is the veteran, having been with Saito for eight years. Fujimoto comes from the same “school” of sushi as Saito (Kanesaka), but has spent more time working at Sushi Kanesaka before coming to Saito more recently. The omakase is the only option. Lunch omakase is HK$1,480 plus 10% service charge. This includes about two appetizers and ten pieces of sushi, tamago, and miso soup. Dinner omakase is HK$3,280 plus 10% service charge. This includes 5-6 appetizers, ten pieces of sushi, tamago (sweet egg omelet), a maki roll, and miso soup. Every morning Saito-san himself goes to Tsukiji Fish Market and picks out the day’s cuts of fish, which are shipped same-day to the Hong Kong location. Both the Tokyo and the Hong Kong locations serve identical menus and use identical ingredients, down to the soy sauce, rice, and additional salts, sauces, and “toppings”. Everything is shipped from Japan. The goal is to produce near identical experiences at both locations. We enjoyed an extremely fun and light-hearted evening with Chef Fujimoto. He is humorous, extroverted, and puts everyone at ease. He joked frequently throughout the meal, and wasn’t shy about posing for photos. I was quite impressed with his efforts to learn not only English (he’s pretty good at that), but also Mandarin Chinese and Cantonese. He fluidly switched between four languages (the last being Japanese, of course) while describing various pieces of fish to different customers. Our meal started with a warm appetizer (otsumami) of seasonal Hokkaido hairy crab. The claw meat was placed on top of shredded meat. The crab was fresh, sweet, and tender. It was a lovely way to start the meal. The next course consisted of two different pieces. Though they appear simple, much work had been done to achieve the tender textures and sweet flavors. The Kyushu abalone was steamed for six hours and then simply served with a side of dipping salt. The flavor of the abalone was outstanding (one of the best I’ve ever had), and the texture was perfect. It was soft, yet still retained a bit of tension and springiness. It reminded me why I had fallen in love with abalone when I first experienced it decades ago. The octopus was beautifully soft and tender, and we enjoyed it with just a dab of freshly grated wasabi. I didn’t ask, but my guess is that the octopus had been massaged for quite some time to achieve that level of tenderness. The next course was a nori wrapped tairagai, or Japanese pen shell. It is the adductor muscle, similar to scallop, but has a firmer texture and more intense flavor. I found the texture of this cooked piece to be a bit tougher than I personally preferred. It had a lot of flavor, but I wished for softer texture. We then started a fun study of three different types of uni. 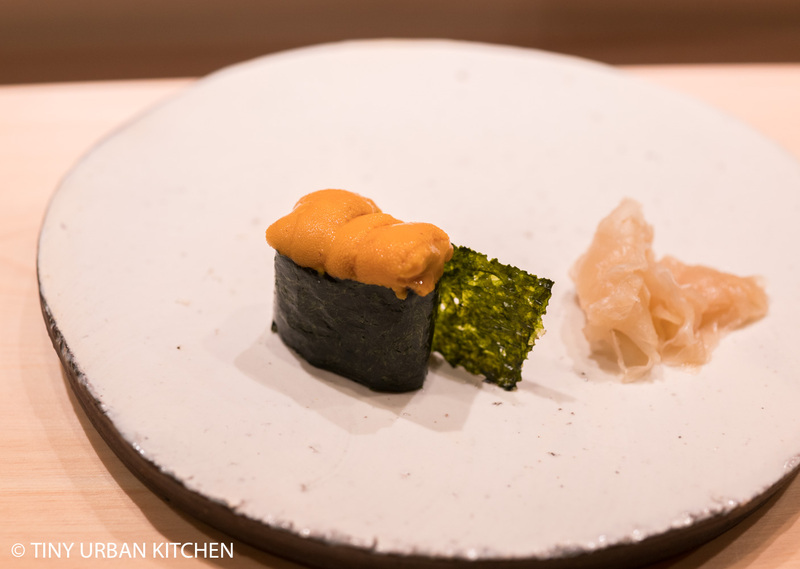 We started with Bafun uni, the orange, creamy one on the left of the plate. This uni is characterized by small spikes. I found this one to be creamy and sweet. Our next one was Murasaki, typically characterized by long spikes. This is the more yellow uni on the bottom right side of the plate. This one had a lighter flavor and less creamy texture, but was still delicious in a very different way. Finally, we tried Aka uni (top) from the city of Karatsu in Saga prefecture. This particular uni was seasonable and only available during the summer. It was interesting to try three together in such short succession to really tease apart the flavor and textural differences. I don’t usually love Ankimo, or monkfish liver, but this Ankimo from Hokkkaido served with a yuzu ponzu sauce was out of this world. I think the bright floral citrus notes from the yuzu really balanced out the rich, creaminess from the ankimo nicely. Honestly, I absolutely loved this course, which is saying a lot considering I usually don’t care that much for this course. Our final appetizer was Nodoguro, a seared piece of sea bream served with pickled daikon and shredded daikon. The dish was nicely designed, with the two types of daikon balancing out the rich yet super tender fish really well. We started the sushi portion of the meal with karei, or flounder, which is only available in summer. I fell in love with the rice. It was just slightly warm, had a nice al dente bite, and was flavored just right with a mild red vinegar. The next bite was kinmedai or golden eye snapper. In my enjoyment of the meal, I actually forgot to take a photo of this piece (! ), though you can see the slices while they were being prepared in the photo above. They are the pink pieces with red skin on the right side. Next came akami or tuna from Wakayama, a region of Japan south of Kyoto and Osaka. The tuna was gloriously soft and tender. I found it a tad on the salty side, though the texture of the entire bite was perfect. Next we had otoro, fatty tuna, also from Wakayama. The flavor was beautiful, though I was distracted by the stringy piece of sinew running through the fish. It wasn’t until later that I learned that Chef Saito chooses that portion of the fish on purpose because he believes the sinew has more umami. Personally, I may prefer a piece without the sinew, but I’ve never done a side by side comparison of flavor. The ika (squid), was lovely, with the right slightly-al-dente-but-not-rubbery texture. I also loved the aji (jack mackerel) from Kagoshima, which was perfectly balanced with its fatty flesh and herb “pesto” on top. I think my favorite uni of all was this fourth kind, yet another bafun uni from Hokkaido, which was luxuriously creamy, sweet, and just perfect all around. I don’t always enjoy kuruma ebi, but this one was excellent. It was cooked just enough to retain the shrimp’s natural sweetness and bouncy texture. The hamaguri (clam) was absolutely fantastic. The texture was spot on, and I loved the brightness from the yuzu zest that was shaved on top. Sorry there’s no photo for this one either. The anago (sea eel) was more savory than sweet, lacking the thick dark sweet sauce that often goes on top of this piece. It was nice, but I prefer the sweeter versions I have had at other top sushi restaurants in Japan. I knew that with the anago (which is often like a pre-dessert since it’s a little sweet), the end was coming soon. Sure enough, Chef Fujimoto started working on a thick futomaki roll. Inside was eel, shrimp, cucumber, egg, and kampyo (a type of gourd). The roll was nice, though not quite as earth-shattering as the earlier pieces had been. This was served with tamago, or egg omelet. The egg omelet is always one of my favorite courses, and this one was excellent and on par with the ones you’d find at top Japanese sushiyas. At this point the meal is over unless if you want extra pieces. Chef Fujimoto asked us all if we wanted a hand-roll. Typically I will say no to extra pieces since I’m usually quite full. However, for some reason, maybe because I was at Sushi Saito, or maybe because I had seen Chef Fujimoto chopping up chunks of toro and akami, I decided to go for it. Chef Fujimoto made a generous hand roll filled with chopped akami (tuna), chutoro (medium fatty tuna), otoro (fatty tuna), negi (scallions), goma (sesame seeds), and takuan (pickled radish). It was soooo good. I loved how the sweet, slightly tart, and crunchy pickled radish balanced out the rich fish. It was beautiful. At a price of almost $50 USD per hand roll (yes, crazy! ), it better be worth it. We ended with a simple miso soup with baby clams. It was clean, light, and a nice way to end the meal. We’re not sake experts, so we relied on the restaurant’s recommendations for sake. I very much enjoyed the sake, especially our first bottle (pictured at left), Katsuyama Junmai Daiginjo “Akatsuki,” a beautifully complex junmai daiginjo sake from the Akita prefecture that went really well with our sushi. Cheers! Pictured: Chef Kenichi Fujimoto, Restaurant Manager Gavin Ho, and us! I really, really enjoyed our meal at Sushi Saito Hong Kong. No question it’s definitely one of the best sushi meals in Hong Kong and on par with the best in Tokyo. I loved the rice especially – the slightly warm temperature, the balanced vinegar, and the al dente texture. The fish was top notch. I loved virtually every piece (save a couple with which I had minor quibbles). In general, it was truly an excellent meal. One cannot help but compare with the other three-Michelin starred sushi restaurant in Tokyo, Sushi Shikon (or Yoshitake in Tokyo). I still think Shikon/Yoshitake has more interesting and more impressive appetizers. Sushi Saito seems to focus more on bringing out the natural flavors in the fish. He tries not to add or modify too much. At most, he balances the fish out or complements it with a splash of flavor. On the other hand, Sushi Shikon/Yoshitake has more creative and unique dishes like the abalone liver and liver sauce or the 2-year aged uni with fresh uni. In short, I think I prefer the nigiri sushi at Saito, but I prefer the appetizers at Shikon/Yoshitake. We actually learned that Shikon uses more expensive rice than Saito. However, I prefer the texture and temperature of the rice at Sushi Saito. I guess price does not always equate with preference, at least in my case! Reservations require a non-refundable deposit and require much advance booking. Currently they are booked out at least a month or more, depending on which sushi chef you request. As I mentioned above, it is very difficult to get a reservation directly through cold calling the hotel or restaurant. You likely need to be introduced by someone who has already been there. Let’s hope that this changes over time so that more people will have an opportunity to enjoy Sushi Saito Hong Kong. Nice write up. FYI, Chef Fujimoto was at Sushi Saito Tokyo for only a few months. He worked at Kanesaka Macau for several years and left to join Sushi Azabu in Miami but his visa never processed so he came back to Tokyo in December and joined Saito to become one of the start up chefs for Saito HK. Kobayashi however has been with Saito for 8 years now. Reading your blog is always so exciting! So glad your life is Hong Kong seems filled with adventures. Great write-up! I think it’s nodoguro(blackthroat seaperch) instead of nodokuro and hamaguri instead of hamagrui for clam. Thank you for catching my typos! Fixed.